The distorted galaxy NGC 2442, also known as the Meathook Galaxy, is located some 50 million light-years away in the constellation of Volans (the Flying Fish). 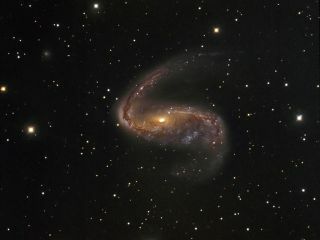 The distorted galaxy NGC 2442, also known as the Meathook Galaxy, is located some 50 million light-years away in the constellation of Volans (the Flying Fish) as seen in this space wallpaper. The galaxy is 75,000 light-years wide and features two dusty spiral arms extending from a pronounced central bar that give it a hook-like appearance, hence its nickname. The galaxy’s distorted shape is most likely the result of a close encounter with a smaller, unseen galaxy.